It’s no secret that we all need to be eating more fruits and vegetables. The USDA recommends that Americans get 5-9 servings per day, and only 1 in 10 of us are able to achieve even 3 servings of vegetables daily. 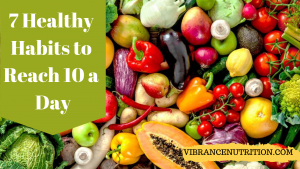 However, epidemiological research shows that the greatest reduction in disease risk happens in those who consume 10 servings of produce a day (curious? Read more here). When we consume 10 servings of produce daily, the risk of succumbing to 9 of the top ten causes of death in the United States plummets. Therefore, the single greatest impact you can have on your health is increasing your intake of fruits and vegetables. Because fruit is easier to access and consume, the bulk of this post is about increasing your vegetable servings. Always have frozen veg on hand: Access to frozen vegetables allows easy, quick solutions on days you realize no vegetables were planned for dinner or are too tired to cook. Add them to a soup, roast or sauté them, or simply thaw in the microwave and top with your favorite sauce (pesto, peanut sauce, marinara, etc). Roast a sheet pan of vegetables weekly: bulk prep of vegetables is a great way to have access to an abundance of produce, especially during the winter months. Roasted veggies last several days in the fridge and using a sheet pan will easily allow you to cook 10-15 servings in a single go. Add veggies to your breakfast: practically unheard of in the United States, yet vegetables often have a place at breakfast tables in other nations. Use roasted veg as a bed for your morning eggs, add spinach or kale to a protein smoothie, or fold last night’s sautéed veggies into an omelet or scramble. You can even try a savory grain based porridge (polenta, oats, quinoa) with egg, bacon and vegetables. Students of my Vibrant veggies class reported morning veggies as the single biggest game changer in their quest for 10 a Day. Keep Fruits out Front and Center: A bowl of fruit is naturally appealing and if it is literally in front of you it makes for an easy choice. Keep more travel-friendly fruits such as apples, citrus and bananas in the car, in your backpack or briefcase, and at your desk for effortless consuming. 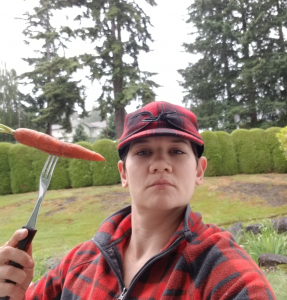 Always be on the Prowl: In my vegetable based challenges and programs I teach people to think of themselves as veg hunters. Veg hunters are always on the prowl and seeking produce wherever they go. Whether or not you order vegetables, seek them out on restaurant menus and ask yourself at every meal, “Where are my vegetables?”. By making them your focus, you naturally increase your consumption of them, making 10 a Day a realistic, daily achievement. Veg hunters are always on the prowl! Multiple times a year I host challenges and coach groups on boosting produce intake. We go far beyond what is here and I help each person overcome the obstacles that limit them in achieving this most important goal. Those who boost their produce intake to 8 or more servings daily consistently report less pain, better moods, better digestion and increased, yet stable energy improvements. If you’re interested in becoming a veg hunter, sign up for my free guide below, “5 a Day in 15 Minutes or Less” to gain access to more tips. You’ll also be alerted to when the next program becomes available and receive several additional tips and recipes to make getting 10 a Day easier than you thought possible!